(UnhappyFranchisee.Com) According to its Facebook page, the Fayetteville CherryBerry first opened April 9, 2010. We could find no formal announcement of the store closing, but the CherryBerry website, maintained by Beautiful Brands International (BBI) no longer lists a Fayetteville, AR location. Customers were evidently left to figure it out themselves. “Does anyone know if this place is closed or not?” Jodie Elenbarger wrote on December 18, 2012. “I just stopped by to have some fro yo and the sign said that they are closed! I hope it’s not for good,” wrote Kristie Michelle Flournoy. 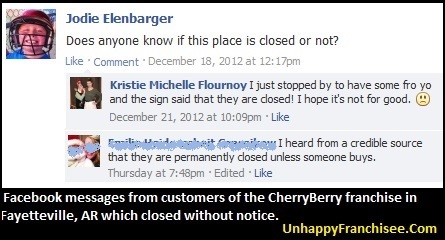 “I heard from a credible source that they are permanently closed unless someone buys,” wrote Emilie C.
Earlier chatter indicated that the Fayetteville CherryBerry may have closed as early as mid-November, 2012, planned to reopen, and then never did. Beautiful Brands International, the company that markets and aggressively sells CherryBerry and FreshBerry franchises regularly promotes the number of franchises it sells, but does not seem to ever announce or comment on its closures. Are you familiar with any CherryBerry store closure? Please share a comment below. UnhappyFranchisee.Com extends its condolences and best wishes to the owners and staff of the closed Fayetteville CherryBerry.